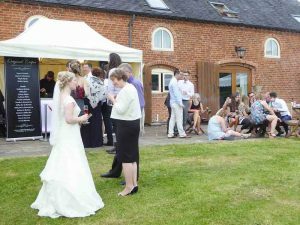 It’s a pleasure to write a review of a wedding we recently attended – the very first wedding ever held at Newfield Green Farm, Marchington Woodlands. Based on the success of the wedding, I am certain the venue will become very popular in the coming years. 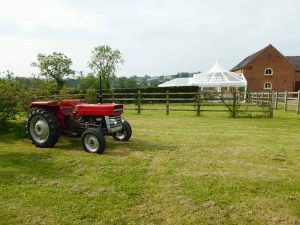 Newfield Green Farm Wedding venue, Staffordshire. 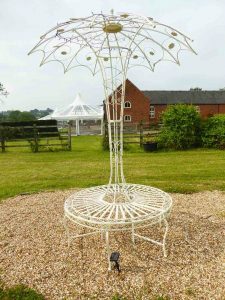 Newfield Green Farm is situated between Uttoxeter and Stafford in the beautiful Staffordshire countryside. 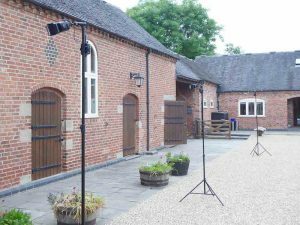 Located in a rural setting and surrounded by fields which help create a feeling of peace and tranquility, the venue is not too far from the M6 so access is fairly straightforward from places such as Birmingham or neighbouring Cheshire. Our SatNav took us straight there at the first attempt (not always the case, sadly!) along some windy, rural lanes, past village halls, churches and fields – quite a nice way to get yourself in the mood for a wedding. 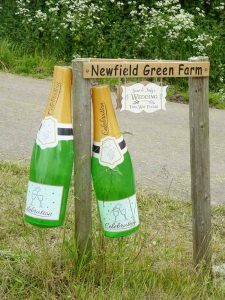 On arriving, we knew we had found the correct location, with a nicely executed, personalised sign and inflatable champagne bottles (something we had never seen before) hanging from the farm sign. Farm weddings vary quite a lot. Some are held on working farms (and we’ve got some very interesting stories to tell on that subject!) some are held on ramshackle (sorry, rustic) farms – but Newfield Green was an extremely clean and tidy farm, with neatly cut grass, clean buildings which are arranged in a horeshoe shape surrounding a large, wide, bright and open courtyard area. 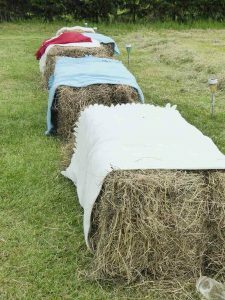 It created the impression of being a former farm which was now very much a wedding venue to be taken seriously. Clean, bright, open and spacious. To the left of the horseshoe arrangement was a large, attractive pagoda-style marquee which acted as a kind of foyer or entrance to the lawned area and main marquee. It was very nicely arranged and was obviously the result of a lot of thought from someone with an eye for aesthetics. Only part of the building shown; the marquee is out of view. After arriving at the appointed time, we met a very happy and friendly bride who was clearly having a great day. She introduced us to the groom who was very exuberant and enthusiastic. The day had obviously gone very well and the speeches were about to begin, so it was decided we leave the mobile crepe station in our van and set-up at a more appropriate time. We took the opportunity to explore a little and found everything to be very fresh and modern, even having a large shower room available for use – something we have never seen before at a wedding. There was a separate ceremony room in the farm building. The reception and dining take place in a large, modern marquee, adjoining. Crepes on the lawn at a summer wedding. As we were providing crêpes as the dessert to the wedding breakfast, our sweet options were extremely popular and as ever, much of the talk we overheard was guests discussing the menu choices and whether a Nutella crepe would be a better option than Milky Bar and fresh strawberry – or whether they should just undulge themselves and choose a Bailey’s and Buttons pancake instead. As is commonly the case, many guests decided that as it was a special occasion, the best option would be to choose more than one! Although we always work very hard indeed, the good thing about weddings is that there are opportunites for a brief break when some of the formalities are taking place. When it was announced that the cake was about to be cut, we managed to take a short break from making crepes and got chance to see more features at the venue. A vintage tractor beside a small orchard. The lawn area had been utilised by guests for various games, including frisbee-throwing and badminton (always amusing to see people wearing suits and evening dresses playing games!) and alongside a small orchard there was a bright red vintage tractor which added a nice visual feature and was something I’m sure children would have enjoyed sitting on. Wedding seating – rustic style! The cake (which was a very attractive cheese cake, something which I have previously written about being a fan of) was situated in the porch area of the marquee along with the seating plan and guest book. At one end of the marquee was the (illuminated) bar, dining tables and seating, with the stage and (ample) dancefloor at the other end of the marquee. 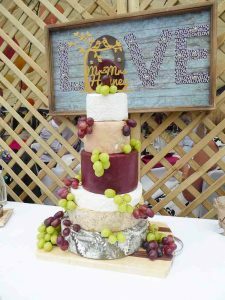 A stylish wedding cheese cake. Following the cutting of the cake and the first dance, the guests once again had crepes on the mind, though as evening guests had by this time arrived, we noticed that the savoury options were becoming more popular – cheese and ham crepes with a little chilli and pepper are very hard to beat – especially after a few drinks! 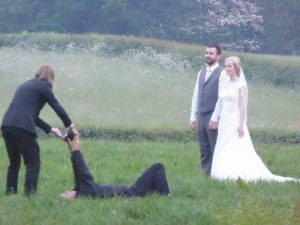 The bride and groom were enjoying an evening photography session in the adjoining fields – a nice, creative idea making good use of the beautiful surroundings. The photographers were very professional and in conversation with them (they had a crepe each, of course) it turned out that they had travelled from Somerset for the wedding and were off to an engagement shoot in Leamington Spa the following day. With the band travelling from Canterbury in Kent and Original Crêpes travelling a significant distance also, it is clear that the bride and groom had decided to assemble the best team they could for the big day! Wedding photographers ‘Enchanted Wood’ in action. As night drew in and it was time for us to load our crepe cart back into our van, the way back to the (ample) car park was lit by multi-coloured bulbs in the trees which was a nice touch and added to the feeling that a lot of detailed thought had been put into creating the best possible experience for clients and guests. 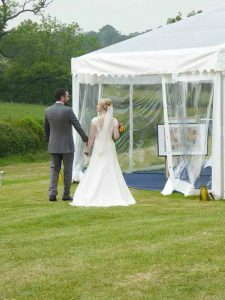 If we had not been informed that this was the very first wedding ever held at the venue, we would have definitely formed the opinion that Newfield Green was long-established. Everything felt very polished and ran smoothly and even minor details had been considered. There was a definite feeling that this was a seasoned and professional wedding venue. 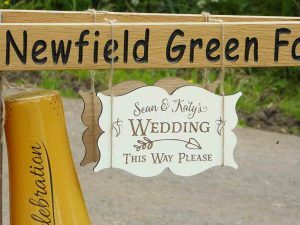 I’m absolutely certain that there will be many, many happy weddings held here and Newfield Green will become a prominent Staffordshire wedding venue in the coming years. The bride orders her crêpe. What a fantastic write up! It was an amazing wedding, every detail thought of. The crepes were so delicious and loved by all, wished we had thought of it when we got married. 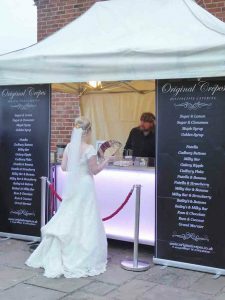 Thanks Jenny; we also enjoyed the wedding and are glad you enjoyed the crepes! It might be too late for your wedding, but next time you are having a party, feel free to drop us a line!